Sinlip 5 mg: Film-Coated Tablets: Box of 30. Sinlip 10 mg: Film-Coated Tablets: Box of 30. Sinlip 20 mg: Film-Coated Tablets: Box of 30. Sinlip 5 mg: Each tablet contains: Rosuvastatin calcium: 5 mg. Excipients: ludipress, colloidal silicon dioxide, poloxamer, vegetal magnesium stearate, opadry white YS-1, red ferric oxide, opaglos AG 7350. 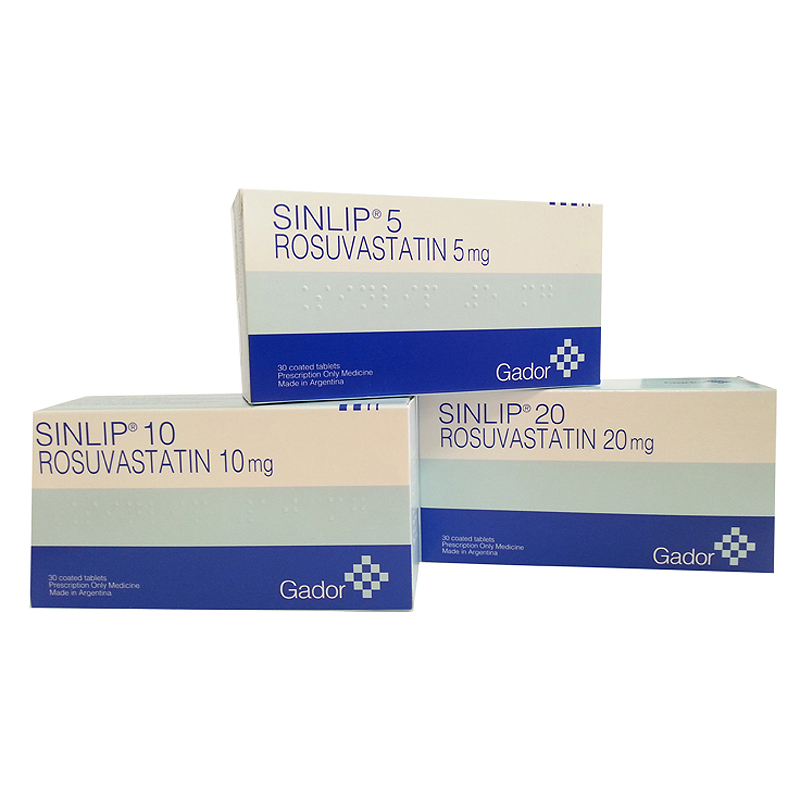 Sinlip 10 mg: Each tablet contains: Rosuvastatin calcium: 10 mg. Excipients: ludipress, colloidal silicon dioxide, poloxamer, vegetal magnesium stearate, opadry white YS-1, red ferric oxide, opaglos AG 7350. Sinlip 20 mg: Each tablet contains: Rosuvastatin calcium: 20 mg. Excipients: ludipress, colloidal silicon dioxide, poloxamer, vegetal magnesium stearate, opadry white YS-1, red ferric oxide, opaglos AG 7350. Rosuvastatin is a selective and competitive HMG-CoA reductase inhibitor. This rate-limiting enzyme converts HMG-CoA to mevalonate, a precursor of cholesterol, Rosuvastatin has the main site of action in the liver, the target organ for cholesterol lowering. Rosuvastatin increases the number of hepatic LDL receptors on the cell-surface to enhance uptake and catabolism of LDL and inhibits the hepatic synthesis of VLDL, which reduces the total number or VLDL and LDL particles. Sinlip reduces high LDL cholesterol (LDL-C), total cholesterol (total-C) and triglycerides (TG) and increases HDL cholesterol (HDL-C). Sinlip also reduces apolipoprotein B (ApoB), VLDL cholesterol (VLDL-C), VLDL-TG and increases apolipoprotein AI (ApoA-1). Sinlip also reduces the relationship LDL-C/HDL-C, total-C/HDL-C. Therapeutic response is seen within the first week of treatment with Sinlip and approximately after 2 weeks a 90% of the maximum response is attained. Maximum response is usually achieved within four weeks and maintained during long-term therapy. Absorption: Peak plasma concentrations of Rosuvastatin are reached 5 hrs following oral dosing. The absolute bioavailability of Rosuvastatin is approximately 20%. Distribution: Rosuvastatin is extensively absorbed by the liver, the primary site for cholesterol synthesis and LDL-C depuration. The volume of distribution of Rosuvastatin is approximately 134 liters. Rosuvastatin is approximately 90% bound to plasma proteins, mostly albumin. Metabolism: Rosuvastatin is not extensively metabolized (approximately 10%). The main metabolites are N-desmethyl and lactone metabolites. N-desmethyl metabolite is approximately 50% less active than Rosuvastatin, whereas the form of lactone is considered clinically inactive. Greater than 90% of active plasma HMG-CoA reductase inhibitory activity is accounted for by Rosuvastatin. Excretion: Approximately 90% of Rosuvastatin is excreted through the feces without modifications and the remaining 10% is excreted through the urine. The elimination half-life is approximately 19 hrs and does not increase at higher doses. Sinlip is indicated as treatment of primary hypercholesterolemia (type lla including heterozygous familial hypercholesterolemia), mixed dyslipidemia (type llb), as an adjunct to diet in patients who do not respond adequately to diet or to any other non-pharmacological treatment (exercise, weight loss). Sinlip is also indicated in patients with homozygous familial hypercholesterolemia, as an adjunct to diet and to other lipid-lowering treatments (e.g., LDL apheresis). Sinlip is contraindicated in patients with: hypersensitivity to any component of this product; active liver disease including unexplained persistent elevations of serum transaminases and any elevation of serum transaminases that exceeds 3 times the upper limit of normal; severe renal insufficiency (Clcr < 30 ml/min); myopathy; patients taking concomitant cyclosporine. It is recommended that liver function tests be performed before and at 3 months following the initiation of therapy with Sinlip. The dose of Sinlip should be discontinued or reduced if the level of serum transaminases is > 3 times the upper limit of normal. As with other HMG-CoA reductase inhibitors, reports of effects on skeletal muscle, e.g. uncomplicated myalgia and myopathy, have been reported in patients taking Sinlip. In patients reporting weakness or unexplained muscle pain, particularly if accompanied by malaise or fever, it is convenient to assess CPK levels, Sinlip therapy should be discontinued if markedly elevated CPK levels occur (> 10 x ULN) or if myopathy is clinically diagnosed or suspected. Clinical studies have shown no evidence of increased musculoskeletal effects in the reduced number of patients who received Sinlip with concomitant therapy. However, increased incidence of myositis and myopathy was observed in patients who received other HMG-CoA reductase inhibitors and fibric acid derivatives, including gemfibrozil, cyclosporine, nicotinic acid, azole antifungals, protease inhibitors and macrolides. Sinlip should not be used by any patient in an acute serious condition suggestive of myopathy or predisposing to the development of renal failure secondary to rhabdomyolysis (e.g. sepsis, hypotension, major surgery, trauma, severe metabolic endocrine and electrolyte disorders, or uncontrolled seizures). Proteinuria, detected by dipstick testing and mostly tubular in origin, has been observed in patients treated with higher doses of Sinlip, in particular 40 mg. Proteinuria was usually transient and has not been shown to be predictive of acute or progressive renal disease. As with other HMG-CoA reductase inhibitors, Sinlip should be used with caution in patients who consume excessive quantities of alcohol and/or have a history of liver disease. Pediatric use: Safety and efficacy have not been established in children. Therefore, Sinlip is not recommended for pediatric use. Pediatric experience is limited to a small number of children (aged 8 years or above) with homozygous familial hypercholesterolemia. Vitamin K antagonists: As with other HMG-CoA reductase inhibitors, the initiation of treatment or dosage up-titration of Sinlip in patients treated concomitantly with vitamin K antagonists (e.g. warfarin) may result in an increase in international normalized ratio (INR). Discontinuation or down-titration of Sinlip may result in a decrease in INR. In such situations, appropriate monitoring of INR is desirable. Gemfibrozil: Concomitant use of Sinlip and gemfibrozil resulted in a 2-fold increase in Rosuvastatin Cmax and AUC. Increased systemic exposure to Rosuvastatin has been observed in subjects receiving gemfibrozil and Sinlip simultaneously. Patients receiving this combination should not exceed one 10 mg/day dose of Sinlip. Cyclosporine: During concomitant treatment with Sinlip and cyclosporine, Rosuvastatin AUC values were on average 7 times higher than those observed in healthy volunteers. Concomitant administration with Sinlip and cyclosporine did not affect plasma concentrations of cyclosporine. Antacid: The simultaneous doping of Sinlip with an antacid suspension containing aluminium and magnesium hydroxide resulted in a decrease in Rosuvastatin plasma concentration of approximately 50%. This effect was mitigated when the antacid was dosed 2 hrs after Sinlip. The clinical relevance of this interaction has not been studied. Cytochrome P450 enzymes: Results from in vitro and in vivo studies show that Rosuvastatin is neither an inhibitor nor an inducer of cytochrome P450 isoenzymes. In addition, Rosuvastatin is a poor substrate for these isoenzymes. No clinically relevant interactions have been observed between Rosuvastatin and either fluconazole (an inhibitor of CYP2C and CYP3A4) or ketoconazole (an inhibitor of CYP2A6 and CYP3A4). Erythromycin: Concomitant use of Sinlip and erythromycin resulted in a 20% decrease in AUC (C-t) and 30% decrease in Cmax of Rosuvastatin. This interaction may be caused by the increase in gut motility caused by erythromycin. Oral contraceptives: Concomitant use of Sinlip and an oral contraceptive resulted in an increase in ethinyl estradiol and norgestrel AUC of 26% and 34%, respectively. These increased plasma levels should be considered when selecting oral contraceptive doses. Other medicinal products: There was no clinically relevant interaction with digoxin, fenofibrates, antihypertensive agents, antidiabetic agents and hormonal replacement therapy. Sinlip is unlikely to affect the ability to drive vehicles or operating machines. Pregnancy: Sinlip should not be used during pregnancy since the safety of Sinlip during pregnancy has not been established. Women of childbearing potential should use appropriate contraceptive measures. Since cholesterol and other products of cholesterol biosynthesis are essential for the development of the fetus, the potential risk from inhibition of HMG-CoA reductase outweighs the advantage of treatment during pregnancy. Animal studies provide limited evidence of reproductive toxicity. If a patient becomes pregnant during use of this product, treatment should be discontinued immediately. Lactation: Rosuvastatin is excreted in the milk of rats. There are no data with respect to excretion in milk in humans. Sinlip should not be used during pregnancy or lactation since the safety of Sinlip during pregnancy and breastfeeding has not been established. The adverse events seen with Sinlip are generally mild and transient. In controlled clinical trials, less than 4% of Sinlip-treated patients were withdrawn due to adverse events. Nervous system disorders: Common: headache, dizziness. Gastrointestinal disorders: Common: constipation, nausea, abdominal pain. Musculoskeletal, connective tissue and bone disorders: Common: myalgia. Rare: myopathy and rhabdomyolysis. Skeletal muscle effects: In clinical trials, few cases of rhabdomyolysis were detected in subjects receiving Rosuvastatin 80 mg, which were occasionally associated with renal function impairment. All these cases improved when therapy was discontinued. Laboratory effects: As with other HMG-CoA reductase inhibitors, a dose-related increase in transaminases and CPK has been observed in a small number of patients taking Rosuvastatin; the majority of cases were mild, asymptomatic and transient. Proteinuria, detected by dipstick testing and mostly tubular in origin, has been observed in patients treated with Sinlip. Shifts in urine protein from none or trace to ++ or more were seen in < 1% of patients at some time during treatment with 10 and 20 mg, and in approximately 3% of patients treated with 40 mg. A minor increase in shift from none or trace to + was observed with the 20 mg dose. In most cases, proteinuria decreases or disappears spontaneously on continued therapy, and has not been shown to be predictive of acute or progressive renal disease. Sinlip can be administered at any time of day, with or without food. Before instituting therapy with Sinlip, the patient should attempt to reduce cholesterol with an appropriate diet, which will maintain during treatment. Dose of Sinlip should be individualized according to goat of therapy and the patient’s response, following the current consensus guidelines. The habituel starting dose is 10 mg once daily and most patients undergo a checkup with this dose. The dose should be adjusted to 20 mg, titrated at a 4-week interval, according to the patient’s response. The 40 mg dose should only be used in patients with severe hypercholesterolemia and high cardiovascular risk, including those patients with familial hypercholesterolemia who do not reach the 20 mg treatment goals. Elderly: No dose adjustment is necessary. Renal insufficiency: There is no clinical evidence indicative of dose adjustment in patients with mild to moderate renal impairment. The use of Sinlip in patients with severe renal impairment is contraindicated for all doses. Hepatic impairment: There is no clinical evidence indicative of dose adjustment in patients with mild to moderate dose adjustment. However, increased systemic exposure has been observed in subjects with severe hepatic impairment. In these patients, the dose of Sinlip should not exceed 20 mg once daily. There is no specific treatment in the event of overdose. In this case, the patient should be treated symptomatically and supportive measures instituted as required. Liver function and CPK levels should be monitored. Haemodialysis is unlikely to be of benefit. Initial treatment for overdosage: After a close physical assessment of the patient, including the time that may have passed since the ingestion or administration of the medication, the quantity of toxics taken and after ruling out contraindication to certain procedures, the healthcare provider should decide whether or not to perform the general rescue treatment: provoked vomiting, gastric lavage, activated carbon, saline purge, etc. Store at room temperature between 15 and 30°C, in its original package.